Just steps from the ocean, your toes will be in the sand in two shakes of your beach towel! 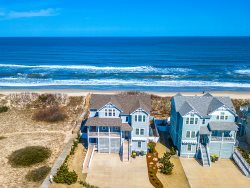 This newly renovated 4-bedroom Outer Banks vacation home sits on a private street in the quiet town of South Nags Head. Spend a week or two at Blue Pearl, and you are in for a treat! 200 ft. from beach access! Enjoy the updated kitchen that features all-new appliances. When you stay at Blue Pearl, you’ll also find new furnishings, fresh paint and updated bathrooms, and well-decorated bedrooms with fresh linens for the best night’s sleep! New flooring has been installed throughout this Nags Head vacation home for the 2018 season! The beautiful tiled, walk-in shower on the main floor will make you feel as though you’re rinsing in the lap of coastal luxury. We know you will love it! Enjoy ocean views from both decks, and wake up at dawn to enjoy the fantastic sunrise over the Atlantic Ocean! Sip your morning coffee on the top deck while watching the dolphins play in the surf! Escape from the sun and take a nap on the lower deck. Kick back and relax in the deck furniture while you read a book or catch up with family and friends! South Nags Head is known for its wide, pristine and unpopulated stretch of beach. Grab your beach towels, your boogie board, your books and have a picnic! Enjoy a long walk along the path of seashells. Get moving by going standup paddleboarding, kayaking, fishing and surfing—or take a bike ride or go for a stroll on the wide sidewalk that runs for miles throughout South Nags Head. Want to drop a line? Head to the nearby Outer Banks Fishing Pier to join locals and tourists alike. (Shhh, Fish Heads Bar and Grille at the pier is an excellent spot for a great meal, cold drink, unbeatable views and people watching!) Oregon Inlet Fishing Center is also just a six-minute drive from Springers Light, and the Bodie Island Lighthouse is just three miles down the street. P.S. If you need to drop a line or email to the people back home, no worries! Blue Pearl offers free Wi-Fi and cable for all our guests. After a day on the beach, head back to the house and hop into the refreshing outdoor shower. The kitchen is perfectly stocked to prepare your dinner, or grab a steam bucket from one of the nearby local seafood restaurants. Cheers to another great day as the sun sets over the sound! Experience the best of both worlds in South Nags Head, where you feel like you are far from it all, while being just minutes away from restaurants, great shopping, the outlet center, grocery stores and tons of opportunities for outdoor recreation. There is so much to do close by! Climb the sand dunes and fly your kite at Jockey’s Ridge State Park. Oregon Inlet, Bodie Island Lighthouse, Jennette’s Pier, the Outer Banks Fishing Pier, Cape Hatteras National Seashore, Pea Island National Wildlife Refuge, Tanger Outlets and Kitty Hawk Kites are just a few of the local attractions you can enjoy during your stay on the Outer Banks. Take a day trip to Ocracoke Island to the south and Corolla to the north to see the wild horses of the northern beaches! Blue Pearl is the perfect place for your next beach getaway. Book your stay today and let the countdown to your beach vacation begin! Welcome to your home away from home! See you soon!